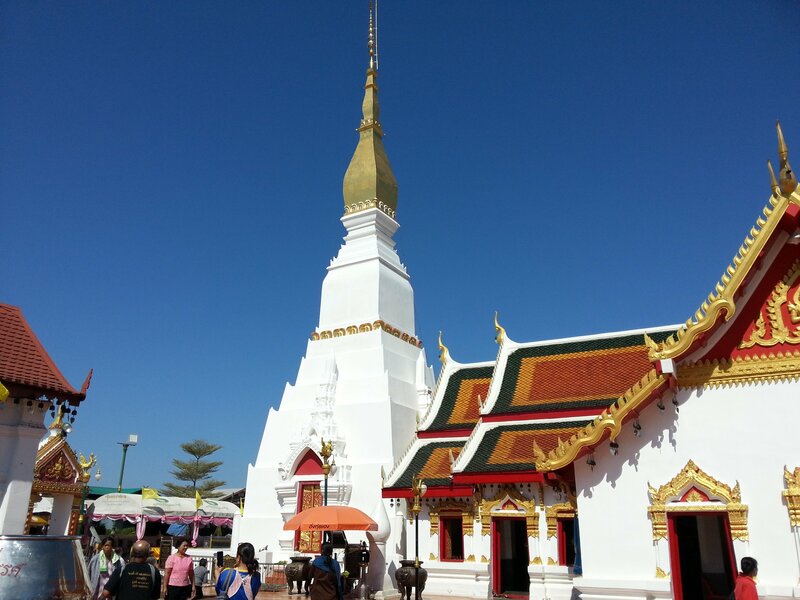 Phra That Choeng Chum is a 24 metre high chedi located within Wat Phra That Choeng Chum in Sakon Nakhon city centre, which is in the North East Region of Thailand. 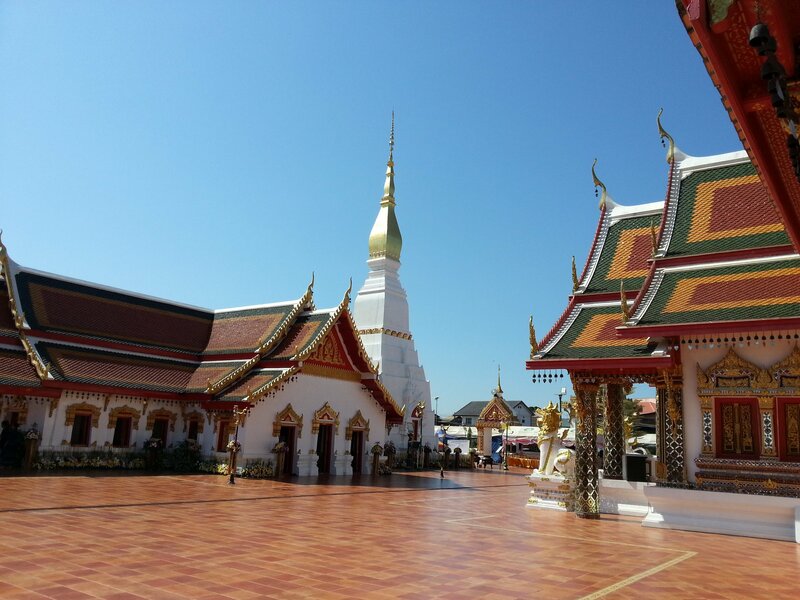 Wat Phra That Choeng Chum is open to visitors from 06:00 to 18:00 every day and admission is free. Phra That Choeng Chum is a thin Lao style chedi, a type of tower, dating back to the 17th Century. Local legend is that the chedi is built on top of the foot prints of 4 incarnations of the Lord Buddha. 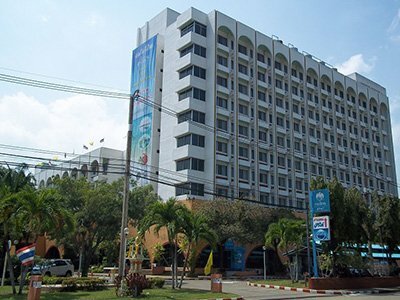 The current chedi has been built on top of a smaller Khmer style chedi built in the 10th Century. The base of the chedi is shaped like a lotus bud, with the top section of the chedi covered in gold paint and topped with a multi-tier gold umbrella ornament. 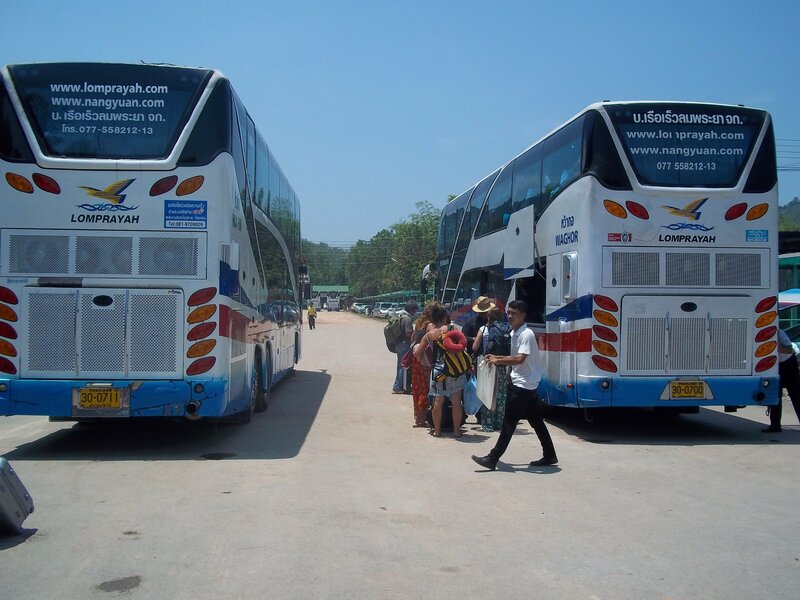 Phra That Choeng Chum is a highly revered Buddhist monument which attracts a lot of mainly Thai visitors. The chedi is surrounded by two large temple buildings. The newer of the two structures is the congregation hall. 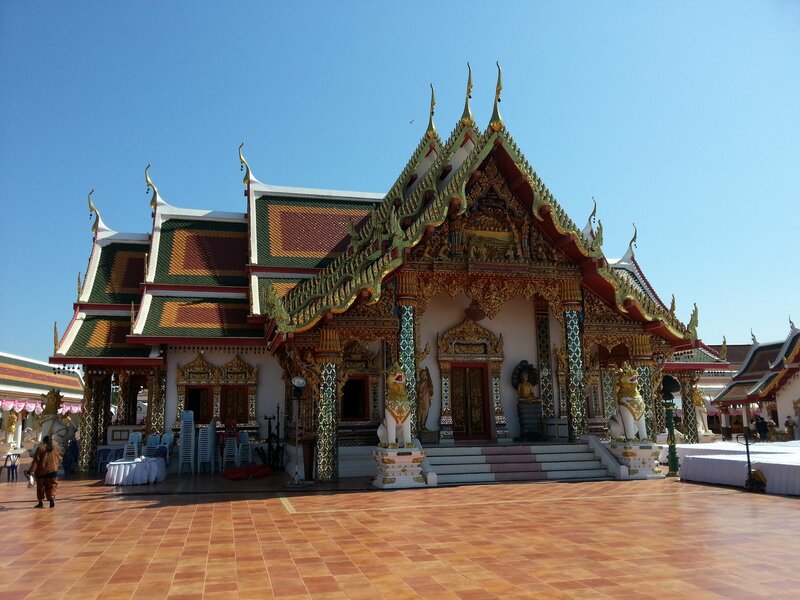 The congregation hall at Wat Phra That Choeng Chum is where the faithful go to interact with the resident monks. 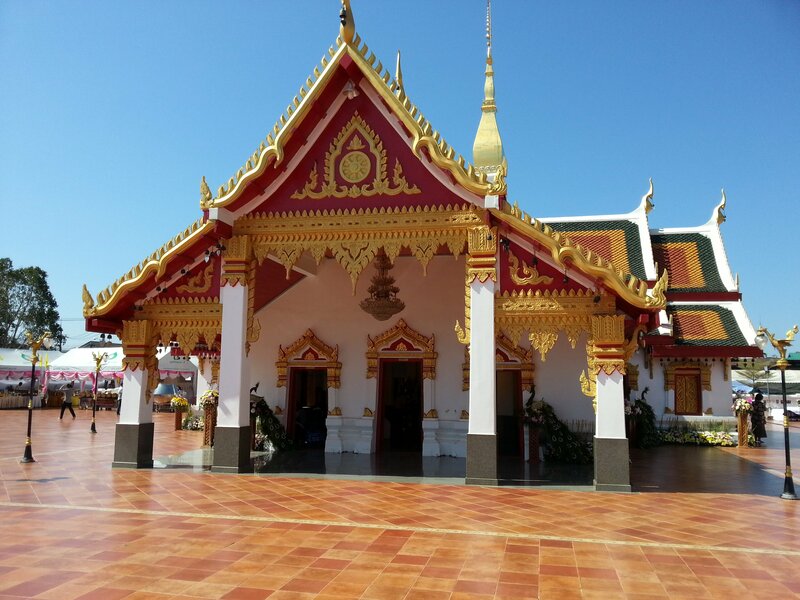 The shrine hall at Wat Phra That Choeng Chum is notable for two things. 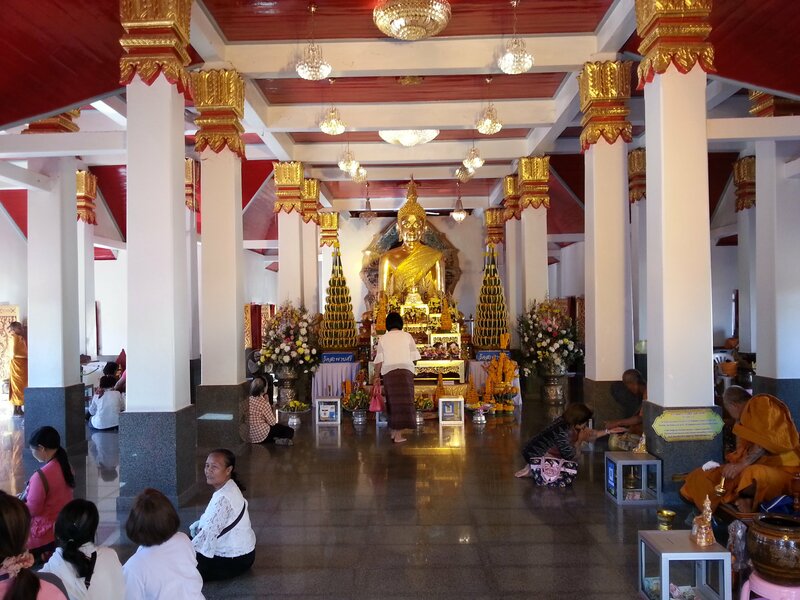 Firstly, the hall contains a Buddha image, known as the Luang Phor Phra Ong Saen, which was cast in 1257 and is considered the city’s most sacred Buddha image. The second special thing about the shrine hall is the decorations. 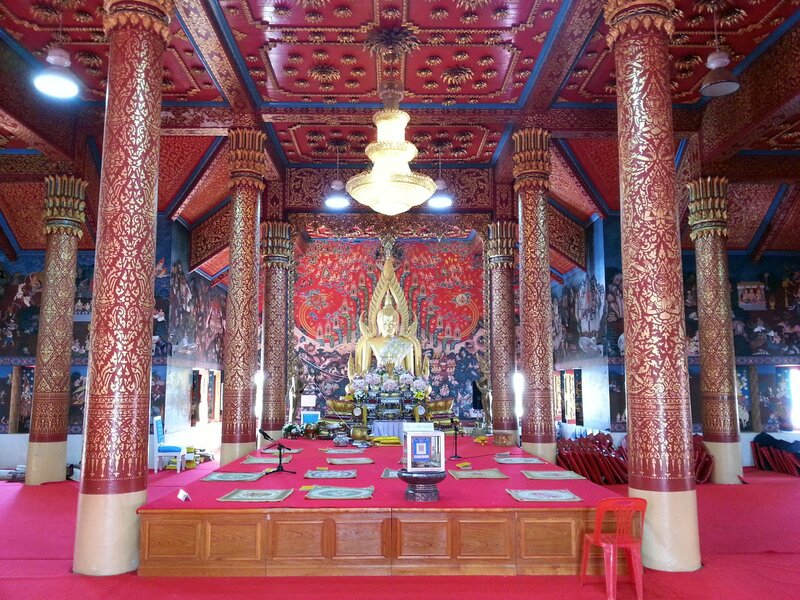 The pillars and the ceiling are covered in detailed stencil gold stencil work similar to intricate work at the famous temples of Luang Prabang in Laos indicating the close relationship between the North East Region of Thailand and the ancient Kingdom of Laos. The wall are covered in paintings of the story of the enlightenment of the Lord Buddha and scenes from the Ramakien, which is Thailand’s national epic itself based on the Hindu classic the Ramayana. 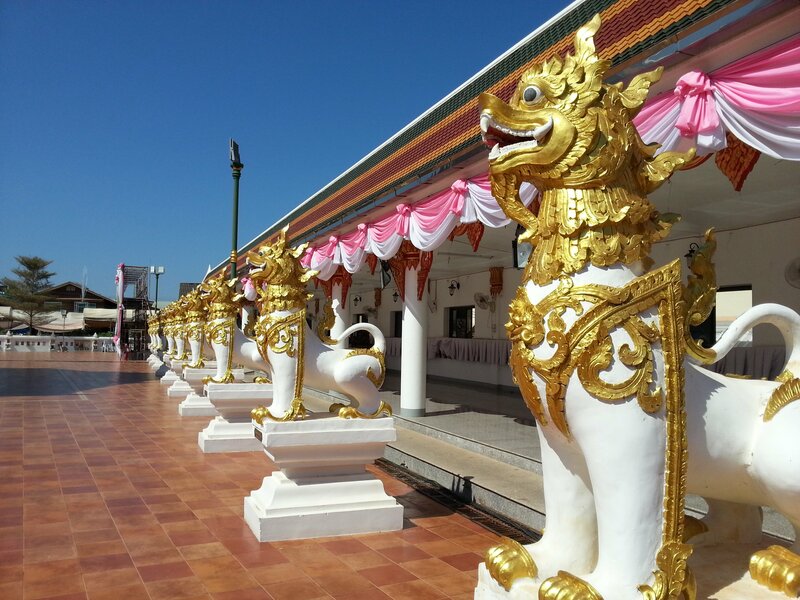 The chedi and temple buildings at Wat Phra That Choeng Chum are complimented by a wide range of statues and ornamental gateways to the square when the chedi is located. Wat Phra That Choeng Chum has a year round carnival atmosphere with a market set up within the temple grounds selling everything from food to clothes. Admission to the temple is free at all and the rent received from stallholders is the main funding source for the temple, which is well maintained and kept very clean. 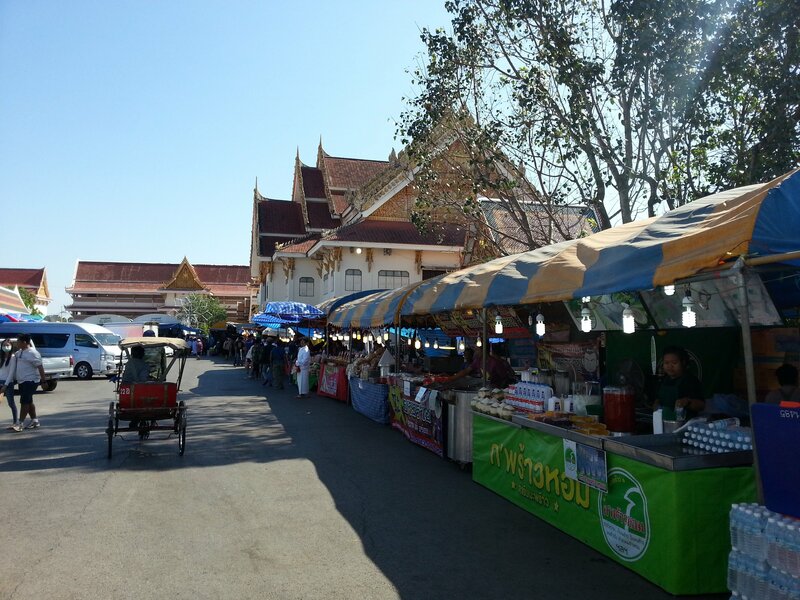 The market also feeds the numerous visitors to the temple who come from all over the country specifically to see Phra That Choeng Chum. The highlight of the year at Wat Phra That Choeng Chum comes at the end of Buddhist Lent, generally in early October, when the temple is the hosts the city’s Wax Castle Festival. Every year local residents create detailed wax models of temples and castles which are paraded through the city centre and then displayed at Wat Phra That Choeng Chum. 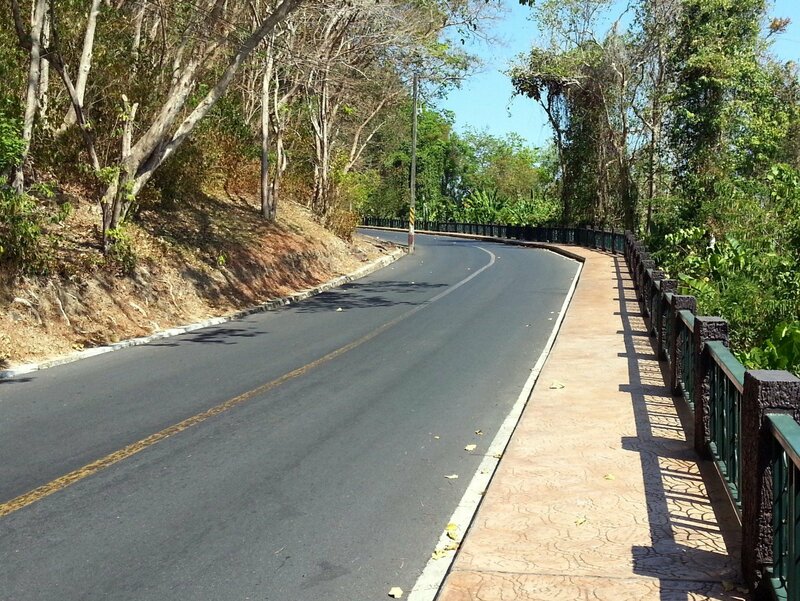 Phra That Choeng Chum is located 5.4 km by road from Sakon Nakhon Bus Terminal 2.